where did you get this new maf,, off fleabay? MAF is very hard to test , lacking source of powerful air flow , very hard to test. seems the new maf is bad to me. seen lots of fake MAFs sold, some are good some are bad, and the suzuki one is $1000? this engine will have no power with a bad maf. or weak maf. engine ok, fuel pressure ok, maf simulation test works. sparks ok or maf simulation would fail. too. sorry if you 2nd maf is bad, truly. sorry. not fun that. ever. oh maf was from amazon. i figured if maf was bad check engine light would come on, it does come on when I unplug it but goes off when I plug it back in. looking on rock auto the maf sensor has multiple Alternate/OEM Part Number(s): 1380065D00, 30020654, FP3913215, FP3913215R00, FS1E13215, FS1E13215R00, they are for mazdas up to 2003 trackers, looking on autozone, orielly etc. my 95 has a different part number and much more expensive than the mazda or 2002 chevy tracker maf's. they look the same and according to rock auto walker maf they are all the same. is this correct? and none of the above numbers are correct. at all. is your car, USA car? do not try to mix up MAFs or risk blowing the ECU to hell, oK> some mafs use 12v outputs. and very bad for your ECU that. in the USA there is only one maf that fits this car, just one, and (1 suzuki number and one for GM/.GEO) and not others work. ok? your old maf has suzuki (mitsubishi or hitachi) number on the side casing and is 58B00: ends in this number. 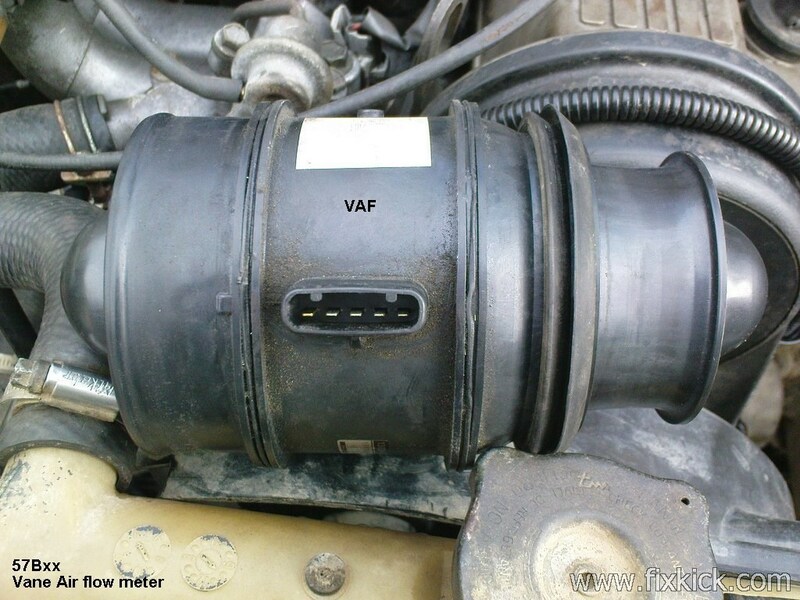 in Europe 57b00 (van air flow ) sensors used and are not MAF at all. and will not work in USA. ahh is see you looking at walker parts, see this,65D00 that is the wrong sensor, there, that number is 1999 to 2003 car, and will never work on your car. is not easy, many sellers sell the wrong part, like above, for 1999+ cars. 57B00 SENSOR IN EUROPE LOOKS LIKE THIS.A VAF IT IS CALLED. AND WRONG. I for sure can not tell you what non suzuki parts (aftermarket) work, not me and is moving target. OBD1 is simple and crude, it has no fancy fuel trim warning like the 1996+ do. all your car has is the rare code 52 DTC, error. for stuck 02. that is it. the only test I have for maf is using leaf blower or huge shop vacuum cleaner to create, huge air flows. I got 3vdc out with my shop vac. Suzuki does not publish the full spec, on this maf, ever. sadly. note the non linear nature of the maf. above. weak MAFs happen , not just dead. even dirty MAFS fail until cleaned. my wild guess is that this maf can do more flow, than any G16b made can do. my guess is it can do 75gm/sec. flows. or up to say 4.5vdc out. but not 4.9vdc , DTC trip point. if you maf is weak you can not gain 95HP ever. so I take it your saying the walker or SKP SK2451155 maf that rock auto and others offer will not work?